The US-KMO early warning satellites of the second generation were developed as part of the Oko-1 system, which was supposed to complement and then replace the first generation US-KS satellite in the Oko space-based early warning system. Development of the US-KMO system began in 1979. In contrast to the first-generation system, which was designed to detect only launches of ICBMs from bases in U.S. territory, the US-KMO system was designed to provide coverage of SLBM launches from oceans as well. 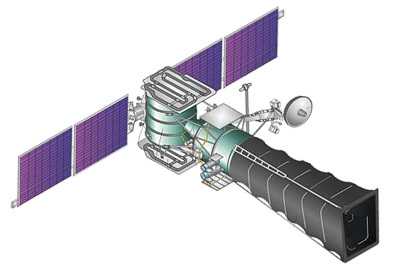 The satellites feature an IR-telescope with diameter of main mirror of 1 m. Length of the deployable sunshade is 4.5 m. The most important distinguishing feature of the second-generation satellites was their look-down capability. These satellites were to be deployed in geosynchronous orbits, from which they could provide coverage of most of the oceans. It is likely that these satellites are supposed to replace the US-KS first-generation satellites in GEO and supplement the US-K satellites in HEO orbits. Details of the US-KMO system architecture are unknown, but it seems that the system in its full configuration would include up to seven satellites in geosynchronous orbits and about four satellites in highly elliptical orbits. All satellites are supposed to have the capability of detecting launches of ballistic missiles against background of Earth surface and cloud cover. It is difficult to determine whether a specific satellite in geosynchronous orbit is a first-generation US-KS or a second-generation US-KMO satellite. The number of satellites that are believed to be second-generation early warning satellites is too low to draw any conclusions about their operational lives. Kosmos-2133 (#1) worked for 56 months, which probably mean that its operations was successful. Kosmos-2282 (#2) ceased operations after 17 months, most likely because of a malfunction. Kosmos-2224 (#3), was operational for 77 months. Kosmos-2350 (#4) ceased all maneuvers only after two months of work, which also indicates a failure. Kosmos-2379 (#5), launched in August 2001 operated for 8 years until late 2009 or early 2010. Kosmos-2397 (#6) developed problems two months after launch and started drifting eastwards in June 2003. Kosmos-2440 (#7), launched in June 2008, failed in February 2010. Kosmos-2479 (#8), launched in March 2012, stopped sending signals in April 2014. The US-KMO are often erroneously refered by the name "Prognoz", as the orbital positions for the satellites were reserved under this name. Kosmos 2479 (US-KMO #8) failed in 2014. Kosmos 2440 (US-KMO #7) 2008-033A 26.06.2008 Ba LC-81/24 Proton-K Blok-DM-2 ?